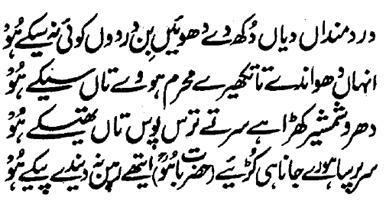 Hazrat Sultan Bahu Rahmatu-Allahe Ta-aala Alaihe says that 'that smoke that rises from the fire of the ached hearts of the Aashiqeen, it is caught and borne only by that heart that is sore with the pain of Ishq and is the Privy (and Insider) of the Secret. A simple example of the pain of this Ishq is as if an executioner is standing in front of you with a naked sword to behead you. And this sword of Ishq is hanging over the head of the Aashiq all the time till the time that the Mashooq feels pity and grants His Wasal to the Aashiq and covers this sword of the states of Hijr and Firaaq in scabbard. 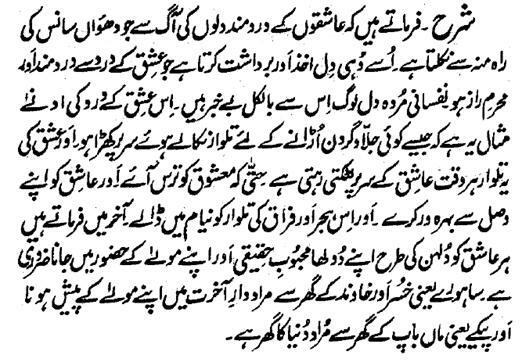 At the end, he says that 'every it is essential that every Aashiq should reach the Hazoor of his broom, the Real beloved and Lord like a bride. Hereafter is like the house of the in-laws where one has to reach after marriage and world is like the house of the parents where one is born.